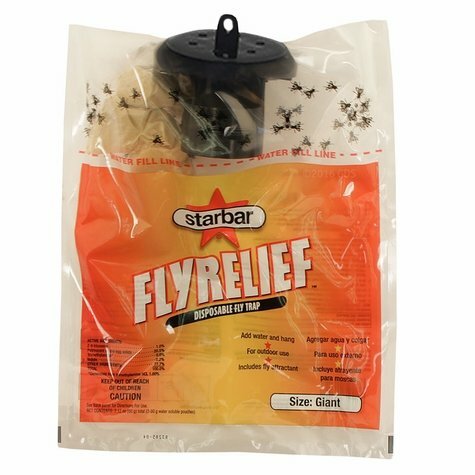 Starbar Giant Fly Relief Disposable Fly Trap. $5.99. 1. Pull up trap top by tab until snapped into position. 2. 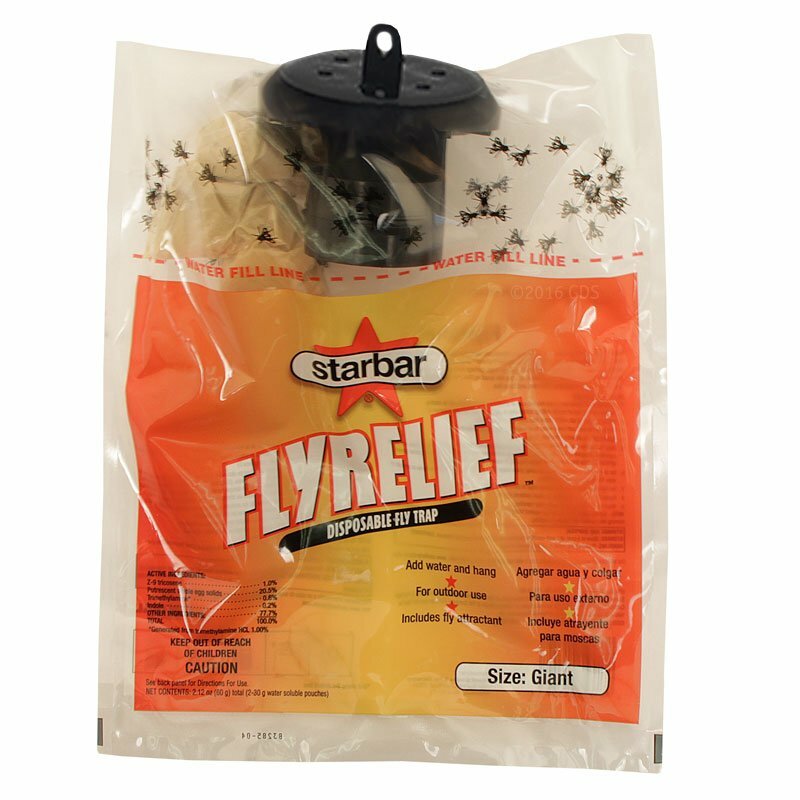 Hang the trap outside in a sunlit area of high fly concentration where flies are active and where odors will not be a problem. For maximum effectiveness, trap should be within 4 feet of the ground. In hot weather (above 85 degrees F), the trap should be placed in a shaded area for optimal results. In cooler weather, place trap in a sunny location. 3. The attractant tube is inside the trap bag and must not be removed. Hold base of attractant tube tightly with thumb and forefinger, pointing tube downward. Twist tip of spout until it snaps, allowing attractant to pour out into bag. 4. Fill trap to "fill line" by pouring clean water through top of trap. 5. Agitate lightly to disperse attractant. Trap is not recommended for indoor use or for use against biting flies. Hold trap upright so attractant does not spill out of top. You may need to squeeze attractant tube to force liquid out. For best results, fill the trap while it is hanging. In areas having exceptionally hard water, using distilled or purified water may improve trap performance. In areas of heavy fly populations, use several traps in different locations. Trap contents should be agitated at least twice weekly to thoroughly wet all trapped flies. Add water as necessary to keep the fluid level 1/2 inch below the surface of trapped flies. Do not allow the trap to dry out. Without adequate agitation fly larvae (maggots) may appear as a layer of dry dead flies accumulates in the trap. If this should occur, add one teaspoon of liquid dish soap and enough water to wet all flies thoroughly. Maggots will drown in soapy water. When trap is full of dead flies, place bag in trash receptacle. Dead flies in trap may give off bad odor so care should be taken to keep trap contents from coming in contact with hands or clothing.